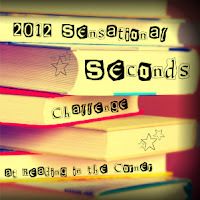 This challenge is specifically focused on YA and MG "seconds" being published between Jan 1 - Dec 31, 2012. This includes sequels (the second book in a series only) and companion novels! I've started a Goodreads list HERE that can help you keep up with some of the upcoming sequels/companions (there are 95 books on the list so far!). Be aware that this list is not necessarily comprehensive, although I've been trying my best to keep it updated. This list is just the US sequels being released in 2012. I'll openly admit that I don't keep up with foreign releases. If you live in another country, feel free to post reviews for newly released sequels in your country! The books must be read between January 1 and December 21, 2012 to count towards the challenge. I know some people have been lucky enough to read some sequels prior to 2012, but those won't be counted towards this challenge. Anyone can join! You don't have to be a blogger specifically, but you do need to review the sequels that you read somewhere (such as Goodreads, LibraryThing, Shelfari, etc.) in English. There will occasionally be giveaways! (Still TBD...but they'll be for participants only). You can join anytime! Just set your goal and get started! For further info about this challenge and/or to sign up to participate, click on the banner above. We will be tracking our progress HERE.